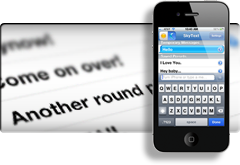 Just Type and Twist...it's that simple Display your messages instantly as a large text banner scrolling across the screen. Simply tilt the iPhone into landscape orientation and your message starts scrolling automaticaly. When you rotate the phone back Sky Text is ready for your next message. 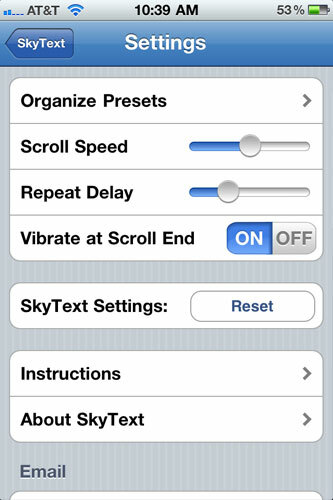 Sky Text is flexible to allow you to use it the way you like. 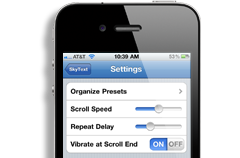 Organize your presets, adjust the scrolling speed, delay speed and much more. Sky Text offers two font and background color combinations called day and night mode. 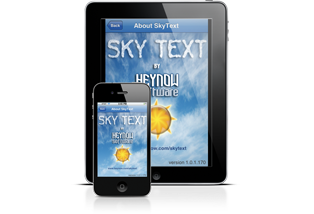 No matter what the situation, Sky Text is ready for you. Presets offer the ability to quickly access messeges you frequently use. 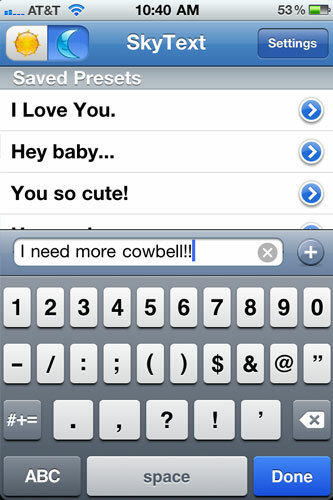 Or you can simply type a message in for those spur of the moment occasions. To start typing text, touch the text entry box. The Keyboard appears and the cursor is blinking, ready to for you to type. Hold the phone up in Landscape orientation to display your message. Note: You can type up to two full lines of text into a message. 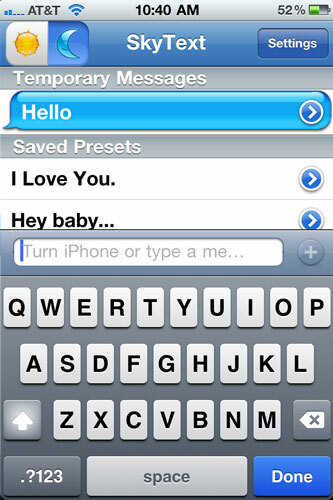 Touch one of the preset messages on the Saved Presets list and it will highlight in blue. Hold the Phone up in Landscape orientation and display the message. Type a message into the text entry box. As you type the first character of your message, the plus button to the right of the text entry box becomes active. When you've finished typing the message, press the plus button. The new preset is added at the bottom of the Saved Presets list. Touch the blue arrow to the right of a preset in the Saved Presets list. The keyboard comes up and the preset message fills the text entry box. Notice that the plus button is now a save button, which is inactive. It becomes active only when you've changed the preset message. Now press the save button (after editing the preset) the new edited version of the preset will replace the old preset. "I used this app to razz my buddies at the colf course - it was great fun." "...I've tried a few of the other BIG text billboards for iPhone and Sky Text is the only one I felt worked properly and as advertised..."
"...The novelty factor of calling o waiter over using your iPhone is worth the price of admission. I'm going to use this app *a lot*..."
Do you have an Apple, Android, or BlackBerry software product you'd like us to design or develop for you? 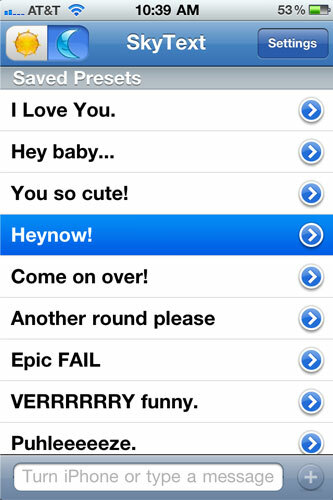 © 2011 Heynow Software. All Rights Reserved.